Huge 18-inch tall Alien warrior action figure! Inspired by Kenner's 1979 Alien monster figure. Features those awesome double-jaws, elongated domed head, creepy claws, and a bony body. It's nasty and its ever so dangerous! 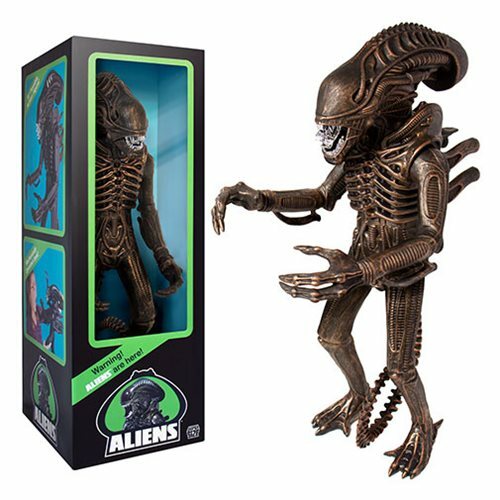 The eerie behind this Aliens 18-Inch Alien Warrior Bronze Action Figure about to jump out of the dark and terrorize your friends. The ominous figure is inspired by Kenner's 1979 Alien monster figure, with awesome double-jaws, elongated domed head, creepy claws, and a huge bony body. Don't miss this classic cinema creature. It's a nightmare! Ages 15 and up.